Psychiatric aide contest winners are visiting at the pioneering training school for psychiatric aides, operated at the Topeka State Hospital under the supervision of The Menninger Foundation and with the financial support of the Rockefeller Foundation. Aide school faculty are left to right, Mary Gangemis, RN, assistant director; Vivienne Hutchens, PA and Esther Wiens, PA, clinical supervisors. 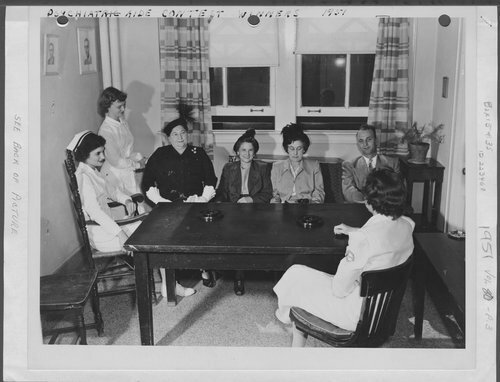 Winning aides are Orpha Griffin of Larned State Hospital, Florence Hollis of Osawatomie State Hospital, Sally B. Cannon of Parsons State Hospital and Everett Franklin Fine of Wadsworth Veterans Administration Hospital.